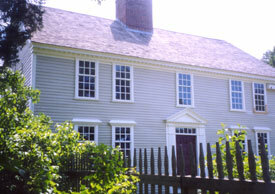 The Reverend Benjamin Caryl, first minister of Springfield Parish, a part of Dedham and now the Town of Dover, built his house at 107 Dedham Street around the year 1774. Built in the Georgian style, the Benjamin Caryl House served as home to the Caryl family until 1928, when it was given to the town and placed under the care and maintenance of the Dover Historical Society. It is particularly noteworthy as a structure - as very few changes were made over the years - and for its first two families, the town's first minister and his son, George, the first doctor. The house is a typical center-entrance, center-chimney homestead of 18th century New England. It faces Dedham Street on its original site, surrounded by the open lands and woods that were once the Caryl Farm and are now the Caryl Park, playing fields of the Dover Park and Recreation Commission. Unlike most surviving structures of the period, the house has never been basically altered or modernized, so it may be seen today in close to original form. 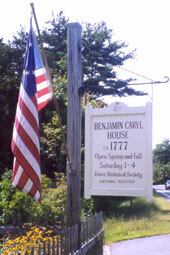 On June 2nd, 2000, the Benjamin Caryl House was placed o n the National Register of Historic Places. The Reverend Caryl served the town as minister for 49 years. Dr. George Caryl, the Reverend's son, occupied the house until his death in 1822, having practised medicine in the town since 1790. His daughter, Mrs Ann Caryl Miller, lived in the house until she died in 1884, and her daughter, Ellen Miller, resided there until her death in 1897. George Chickering recognized the historical value of the property and purchased it from Ellen Miller's estate. Under Mr. Chickering's will, the property was left to the Town of Dover, to be administered by the Dover Historical Society. In 1975, the Caryl House was repaired and refurbished in preparation for the Nation's Bicentennial. Furnishings appropriate to the period, including some which belonged to the Caryl family, were carefully selected by a restoration committee and acquired through gift and purchase. The hangings and coverlet on the four-poster bed were carefully duplicated in linen and handsewn crewel by ladies of the Society from a remnant of the originals in Mrs. Caryl's own handiwork, now in the Society's collection.